My gorgeous niece and God daughter Molly is about to turn 3. 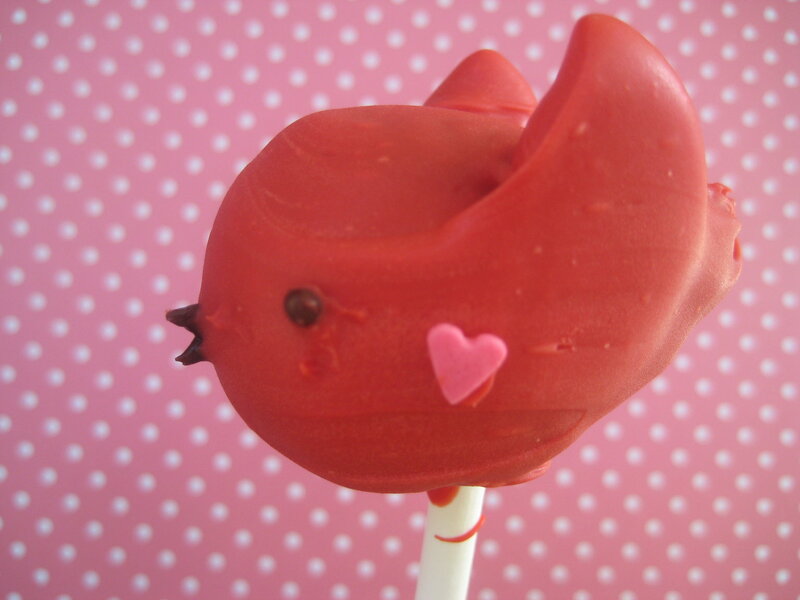 I just received her invitation with the cutest little red birdie on it and I had a crazy idea to make bird cake pops for her party. Seemed like a simple enough idea. 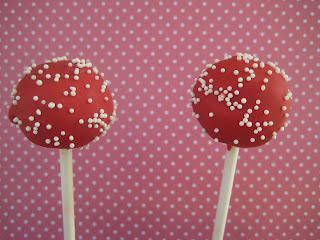 So I sat down to channel my inner Bakerella (cake pop queen).......but just so you know not in a creepy Julia and Julia blogging way where I sat around in pearls and made my husband watch endless videos. I thought I had a pretty good plan, but like everything it seems so much easier when someone else does it. My first one was pretty lumpy. But I quickly worked out a dipping and twirling technique that seemed to make all the difference. These birds required dipping the back/top first, then starting at one side, the front, other side and finally the back in a kind of twirly movement. 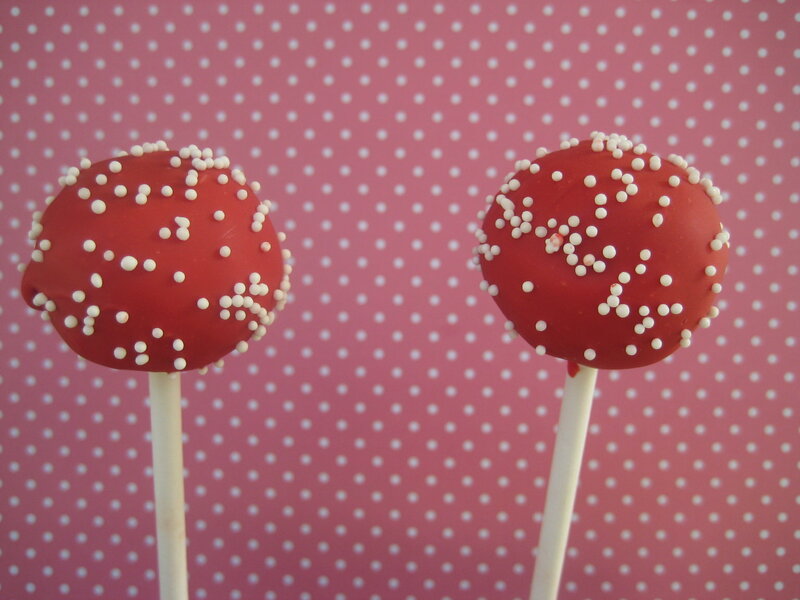 and also their matching red polka dot partners. Although from the front I think my birds look a bit like weird devils or maybe Koala bears. 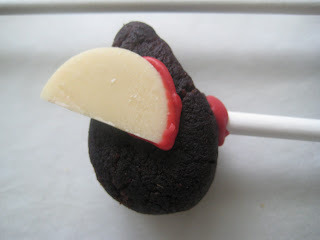 Make sure to get some Wilton Melts or other candy type melts for these, as normal chocolate doesn't seem to give the right consistency for the dipping. As with most things you can find them on Ebay or my local cake decorating shop sells them. In Australia I think that Spotlight has them sometimes too. Crumble 1 chocolate cake approx 20cm and mix with 1.5 to 2 cups of frosting (any kind will do). Mix together until it is a consistency that you will be able to form the balls. 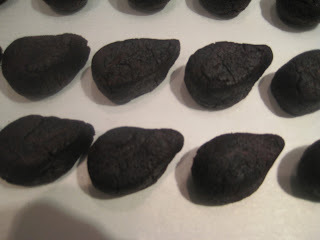 Roll the mixture to form golf ball sized shapes. Using your fingers shape the balls into a kind of teardrop shape as per picture. Chill in fridge. Melt some red wilton melts in the microwave in 30second bursts at 50% power mixing well in between each burst. 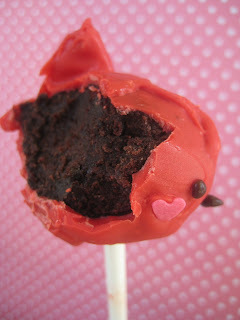 Pop the end of your cake pop stick a little way into the melted chocolate and then pop into the chilled cake mixture. Return to fridge until set. Cut candy melts in half and using some of the melted chocolate stick onto the side of the birds to make wings. Do one side of the wings and then chill in the fridge until set. Repeat with other side. Make some eyes and beaks ready to pop onto the birds. If you have little black candies or liquorice that would be great. I had some modeling chocolate on hand. It was not perfect as it was a little sticky and fiddly but worked out ok.
Dip cake pops into the melted chocolate, top first, side, front other side and bottom. Quickly add eyes, beak and any other decorations. 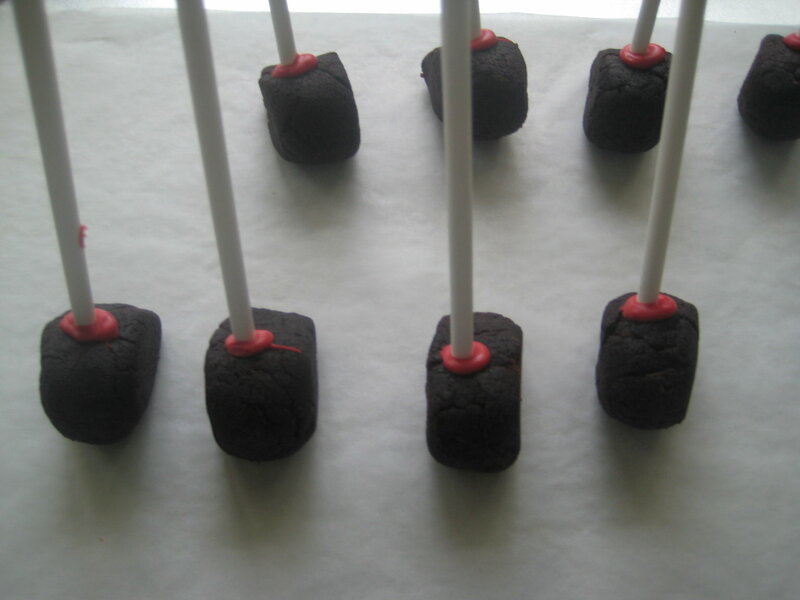 I used some florist foam to hold the sticks upright until set. 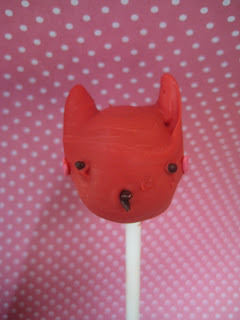 If you want a multitude of other cake pop ideas, click on over to Bakerella's site, she is a bit of a cake pop queen. Ooh love them! You're so creative Linda! :o I was wondering how you got the shape and the wings! the birdie pops are so cute, i bet my daughter wil sure love them! These are just adorable. Bravo! I'm thinking these would be really cute in Blue. Might try that next. 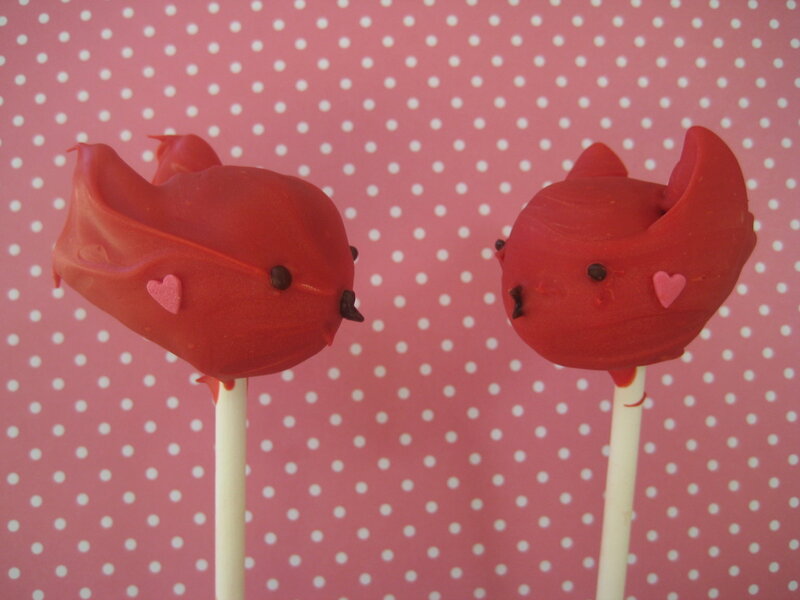 OMG, those are such adorable cake pops! Awesome job, you must have a lot of skill and patience! Gaaaaahhh those are so cute. Oh my gosh. I want to cuddle and then chomp them. How clever are you - these look great. So clever and totally adorable. I'm borrowing your idea for our Great Grandma's 80th birthday party this weekend. I just love your website! how early can i make this cake pop? if the party on sunday..when do you think is the best time to make it? do i need to put in the fridge after i give the candy coating? 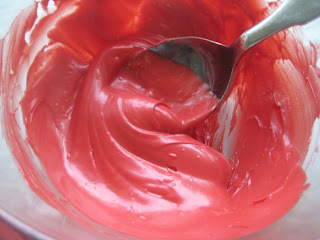 A lot depends on your ingredients, if your using cream cheese you will need to take that into account. I usually make these up 3 days before our parties in an airtight container in the fridge and still eat left overs a couple of days later.